Chennai Sep 15 (IANS) The countdown for the Indian rocket Polar Satellite Launch Vehicle s (PSLV) lift-off on Sunday began on Saturday at the rocket port in Sriharikota in Andhra Pradesh the Indian space agency said. According to Indian Space Research Organisation (ISRO) the countdown for the launch began at 1.08 p.m. on Saturday. The rocket will blast off at 10.08 p.m. on Sunday. 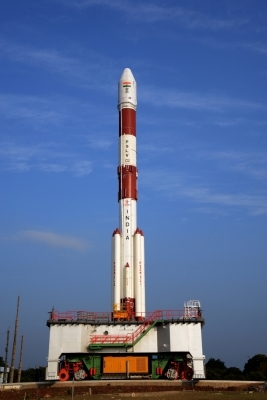 The PSLV rocket will blast off from the first launch pad of Satish Dhawan Space Centre in Sriharikota. Two satellites aboard the PSLV belong to Surrey Satellite Technologies Ltd (SSTL) UK under commercial arrangement with Antrix Corp Ltd the commercial arm of ISRO. According to ISRO the two earth observation satellites will be launched into a 583 km sun synchronous orbit. The total flight duration of the 44.4s metre tall 230.4-ton PSLV rocket will be about 17 minutes 44 seconds. NovaSAR weighing 445 kg is a S-Band Synthetic Aperture Radar satellite intended for forest mapping land use and ice cover monitoring flood and disaster monitoring. S1-4 weighing 444 kg is a high resolution Optical Earth Observation Satellite used for surveying resources environment monitoring urban management and for disaster monitoring.